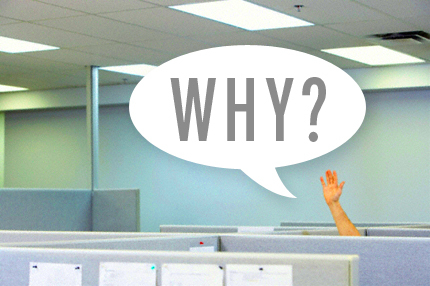 Total Athletic Therapy: The Power in Asking "Why?" The Power in Asking "Why?" I was listening to a podcast (shocking I know) on the way down to UW-Madison and it had nothing to do with health and fitness but there was something in it very powerful that I think can be applied so some big areas of the world of health, wellness and performance. The episode was on the Tim Ferris Show as he was interviewing Ricardo Semier who has been a very successful business man in Brazil and author of The Seven Day Weekend. When Ricardo took over a major company as CEO he turned it upside down but in a good way. He and his leadership shifted the entire culture of the company as well as letting go of some long standing employees and it all started with asking 'why?'. Ricardo implemented the '3 Why' test for absolutely everything in the company. They would analyze any aspect of the company and ask Why. Almost every time no matter what the answer was they would again ask Why, and to complete the 3 Why test they would ask one more time. If you could answer and 'justify' the true reason within those 3 whys you kept it. If you couldn't, it went away just like that. We are going to look to apply that same concept to some very important steps in your health and fitness world. This may be one of the most important steps in your work to get healthy and fit so it is important to test out and also to choose wisely and this is where 'why' can be so helpful. Even as the person searching for a place to workout you don't need to be an expert in talking the lingo but have your BS detector on high alert. Asking how someone might train you is the first step, making sure they can answer the why is equally as important. If you don't leave feeling good about their reason for why they want to train you a certain way or how they run their gym/studio you may want to keep looking. The 'why' behind running their gym is extremely important to make sure your best interests are at heart and that isn't for them to 'get rich' or just own a gym. Always make sure they can answer why. I don't know that we need to dive too deep in here when it comes to 'why' you are wanting to make a change or get yourself to a certain place that you've been looking to get to. This is an area though that I think the addition of the second and third 'why' are extremely important. It is easy to say you want to start working out and the why being; I want to lose weight but I think we've found if that was enough then people would still be on their new years resolutions. Diving in deeper into your reason why can help it stick and not make it easy to pass by. Use the second and thirdly why. This comes down to the more specifics after you follow up on where you are going to be training. Jumping into the latest fad (we aren't sure what that is currently, hard to keep up) isn't a great why and often will lead you to disappointing results. Again start with why number on in that maybe the type of training you're looking at will help you move better and get stronger. Why would you want to do that? To be able to live more pain free and also be more able in everyday life. Why would you want to do that? Well I honestly think number two answered it but to put the cap on you can answer it with "playing with children/grandchildren" "playing golf again" or any other major goal you had. Make sure you know 'why' you are getting into a certain type of training. It seems simple enough to ask 'why' and that this post wouldn't really be needed but having implemented the '3 Why Test' into my life has been an eye opener and pushed me relook at and rethink so many things to figure out if they are really needed and I can't see that as a bad thing. Try adding it in your health and fitness life as well as your own personal decisions and I don't think you'll be disappointed.